"One of my favourite producers, Potash Farm from my home county, Kent, has produced a deliciously decadent Chocolate and Kentish Cobnut Fudge. 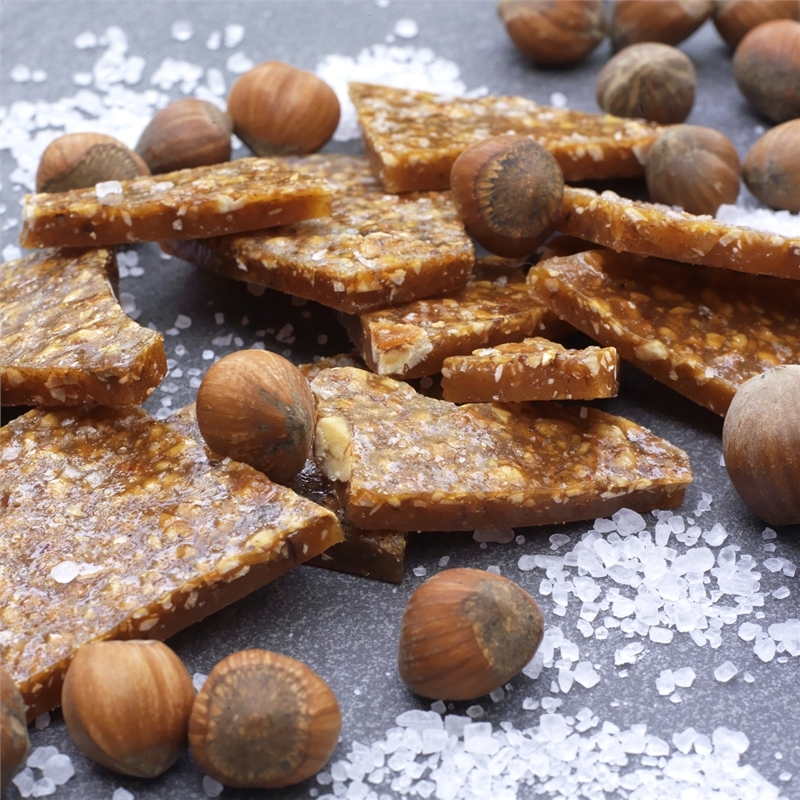 Not too sugary, the little crunchy pieces of nut with the soft fudge is a lovely combination of textures and flavours"
"Try Potash Farm's new Toasted Kentish Cobnut Brittle. As with any great Brittle, it's tooth-stickingly sweet and buttery, with the strong comforting flavour of Cobnuts." This is the first of the Kentish Cobnut brittles produced by Potash Farm. It is an alternative to the two fudges and makes an ideal gift for Valentines Day, Mothering Sunday, Easter or at Christmas. Available in a 150g bag. "Potash Farm makes lots of lovely things from Kentish Cobnuts - we can't get enough of its, buttery, sweet and salty Cobnut Brittle." Really love the subtle taste of the cobnuts. I could eat the whole packet in one go! Bought this a few months ago at RHS Hyde Hall in Essex. Intended to give it as Christmas presents but it didn't even last a weekend. It was so scrummy, with a real nutty/salty flavour, I could not leave it alone, so am now having to order more online to give as presents. The man I bought it from was so pleasant and informative an it was no trouble for him to open whatever I wanted to taste. Also bought choc. covered nuts and cheese biscuits. Delicous!! This is the second of the Kentish Cobnut fudges produced by Potash Farm. It makes an ideal gift for Valentines Day, Mothering Sunday, Easter or at Christmas. Available in a 200g bag.